This super-quick, no-cook, no-fuss vegan dish is a delicious and healthy alternative to traditional spaghetti pesto. Equipment and preparation: For this recipe, you will need a julienne peeler. This meal provides 378 kcal, 10g protein, 14g carbohydrate (of which 5g sugars), 31g fat (of which 6g saturates), 11g fibre and 0.9g salt per portion. For the pesto, blend all of the ingredients and 9 tablespoons water to a rough paste in a food processor. Add extra water to loosen the mixture if necessary. Season with salt and pepper. Set aside. For the courgetti spaghetti, peel spaghetti-like strands from the courgettes using a julienne peeler, collecting them in a large mixing bowl. Scrape the pesto on top of the courgette strands and carefully stir until the courgette is evenly coated. 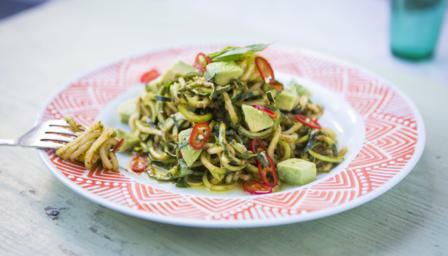 To serve, pile the courgetti spaghetti and pesto onto serving plates and top with the chopped avocado, reserved basil leaves, chopped chilli and a drizzle of extra virgin olive oil.